Missouri Vote Fails On Measure To Invalidate Federal Gun Laws : The Two-Way The effort to override a veto by Democratic Gov. Jay Nixon on legislation that would have nixed federal rules fell one vote shy of passing. 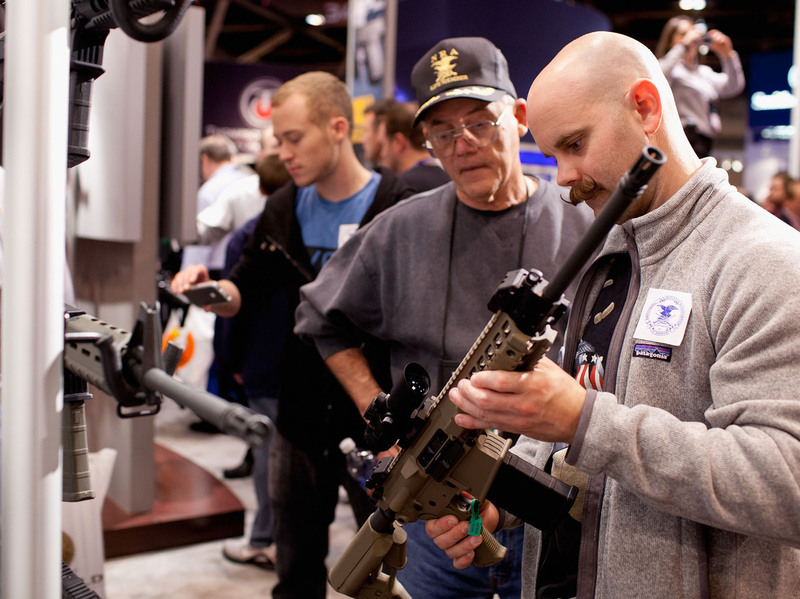 George Sherer and his son, Jeff, look at a SIG Sauer 716 patrol rifle during the NRA Annual Meetings and Exhibits last April in St. Louis. Missouri lawmakers failed to override Democratic Gov. Jay Nixon's veto of legislation aimed at invalidating certain federal firearms restrictions. Senators voted 22-12 Wednesday night to override the veto, falling a single vote short of the required two-thirds majority. The override had already passed the Republican-controlled House. "The legislation had declared that any federal policies that 'infringe on the people's right to keep and bear arms' shall be invalid in Missouri. It would have created state misdemeanor charges against federal authorities who attempted to enforce those laws or anyone who published the identity of a gun owner. Another provision could have allowed police and prosecutors to be targeted with lawsuits for attempting to enforce the nullified laws." According to NewsTribune.com, Nixon has said "the bill could violate the U.S. Constitution's guarantee of free speech and its supremacy clause that gives precedence to federal laws over conflicting state ones." "The Missouri legislation was one of the boldest examples in a nationwide movement among states to nullify federal laws with which local officials disagree. A recent analysis by The Associated Press found that about four-fifths of the states now have enacted laws that directly reject or conflict with federal laws on marijuana use, gun control, health insurance requirements and identification standards for driver's licenses."